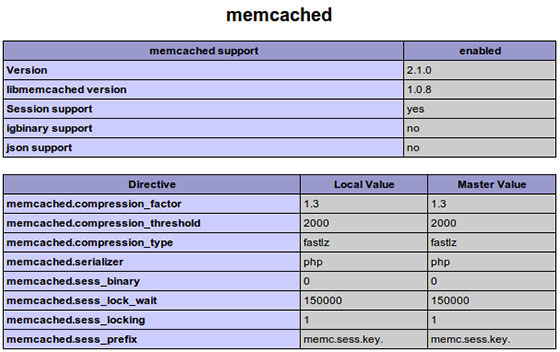 This how to will help you with your install and configuration of Memcached on your CentOS 7 server. For those of you who didn’t know, Memcached is a system daemon that allows you to cache information on RAM memory, this allows you better app speeds and avoid bad performance on your dedicated or vps server. It is very useful for optimizing dynamic websites and enabled speed by caching objects in memory. This article assumes you have at least basic knowledge of linux, know how to use the shell, and most importantly, you host your site on your own VPS. The installation is quite simple. I will show you through the step by step installation Memcached on CentOS 7 server. PORT="11211" USER="memcached" MAXCONN="1024" CACHESIZE="512" OPTIONS=""
Step 4. Configure Iptables for Memcached. Try to access it at http://your_server_ip/info.php. If the PHP info page is rendered in your browser then everything looks good and you are ready to proceed further. Congratulation’s! You have successfully installed Memcached. Thanks for using this tutorial for installing Memcached in CentOS 7 system. For additional help or useful information, we recommend you to check the official Memcached web site. Related Posts of "How To Install Memcached on CentOS 7"